I attended the annual Fete at the Islamic College of Brisbane this weekend for my weekend dose of Halal-ness and inspiration. Due to an ever-growing Muslim population virtually everywhere in the world, our functions and gatherings always come with traffic congestions, parking issues and crowd control problems which we’ve grown accustomed to. Despite the massive turnout yesterday, I was impressed at the orderly manner in which we, as a community conducted ourselves. While I can’t comment on the success of the fund-raising initiative, from a social perspective, it was a success. Despite the anti-Muslim media frenzy over the paste decade, the broader community have learnt the secrets of our gatherings and functions… The FOOD! It’s always a pleasure to see Muslims and Non-muslims coming together to celebrate and enjoy the many diversities our cultures have to offer. A true sense of community, family and brotherhood was on display which is a real display of what we, as Muslim’s mean when we claim that Islam means peace. Nothing is more Peaceful than a group of Muslims from all over the world, living in a Western Land, coming together to raise funds for the growth of an Islamic School. The organisation of the event has been improving each year, the school itself has grown at an amazing rate over the last 5 years which is a positive sign for the Muslim community in this area. Support came from the muslim community, non-Muslim community as well as local government representatives and officials who understand the major role the Muslim community plays in the area. There is distinct benefit in promoting and facilitating a single, united Ummah or community, particularly when residing as minorities in Western countries. The unity, discipline and strength displayed when the community stands and works together is precisely what we need amidst the global onslaught on our Religion. Events that are hosted, supported or held at Islamic institutions have a special significance in promoting a true impression of both Islam and Muslims in the context of social integration. When you have Muslims from a range of ethnicities including so many reverts, Islam becomes more than just a brown religion. When people of different races, cultures and ethnicities unite for the sake of faith, it makes it easier for the broader community to understand and accept that Islam is not a brown religion, not an Arab religion but a world religion. This display of unity can dispel arguments that question our ability to work together and integrate with the rest of society. The social, yet Islamic environment also displays the simplicity of our faith and the ease with which our religious obligations can be met alongside our social and personal lives. 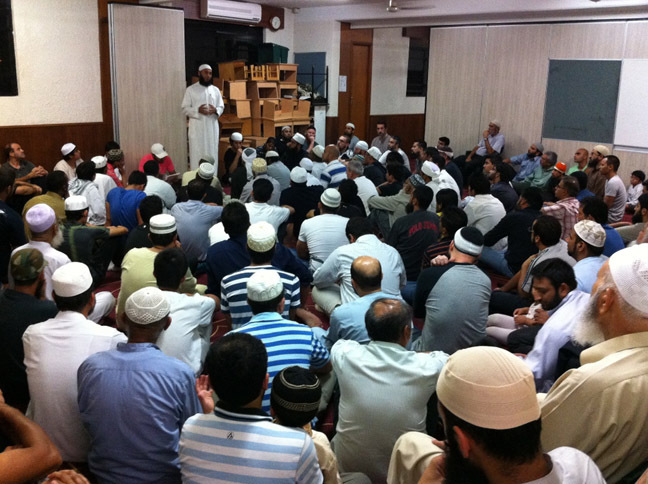 It doesn’t take much for a gathering to be Islamic, it usually starts with a prayer or recitation, music is kept to minimum if any, entertainment is usually provided by kids in the form of song or art and when the time of prayer arrives, Muslims answer it by getting together in a designated place and praying together which usually takes no more than 5 minutes. Thereafter, the eating, drinking and socialising resumes. As Muslims, this is something we take for granted but for a non-Muslim observer, this informal display of our religion can make a massive difference to their views and perspective on what is portrayed to be a strict and heavily regulated set of restrictions. I believe our functions should remain Islamic at the core as a point of difference rather than simply being events organised by Muslims. The Fete was truly Islamic and provided a platform for social interaction, religious integrations and most of all… the best Da’wah or propagation of Islam which is through action and behaviour rather than simply words. The Islamic College of Brisbane is very special to me and I hope one day, to send my kids there too. I pray that Allah grant them success and protect their reputation. As Muslims, it is OUR responsibility to support OUR institutions. 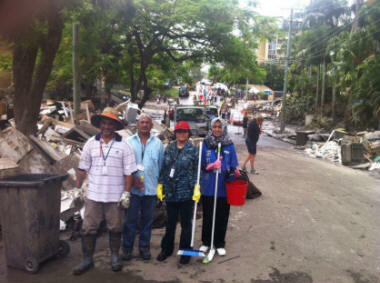 I’d like to congratulate and acknowledge the efforts of the Muslim Volunteers who assisted with the QLD Flood Crisis. I pray that you are rewarded in this world and in the hereafter Insha Allah. Below is a letter received from a victim of the recent floods. Thank you so much, we went without food etc. for 3 days and eventually got picked up and were at Lowood Evacuation Centre when you delivered your bundles of kindness….we were home again and after a few days SES came to help hose mud out of sheds….they also brought out one of your green bags which was very much appreciated. I was so impressed that it was a brand new face washer not to mention the brand new toothbrushes and the amount of thought put into the contents. If we can return your kindness in any way please let us know. My 6yr old son goes to West Moreton Anglican College…maybe your priest could talk to the chaplain and give a talk on Muslim spirituality and join in chapel one morning. I am technically Church of England but I don’t know much about religion. With all the hostility in the world it is a wonderful thing that your faith has done for the flood victims. I know my family will never forget your kindness and the effort you went to for us. This is a true form of Dawah and an excellent display of Islam in Queensland. I hope we hear of many stories like this one, Queensland is not short of natural disasters this year, so lets take advantage of this and spread Islam by being good Muslims.